It seems that in most every major city one visits there is a Calder stabile on display in a park or a plaza. Every self-respecting art museum with any pretension to covering 20th century art has Calder pieces in their collections. The work of this incredibly inventive sculptor has long held both critical and popular acclaim. His art is accessible in every sense, perhaps so accessible over so many years that it has become rather easy to take it for granted. 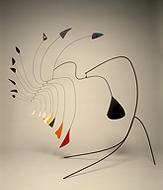 And then along comes this major retrospective of Calder’s works (viewed by culturevulture at the National Gallery in Washington) which, by bringing together and intelligently displaying over 250 objects from throughout his career, forces one to look with a fresh eye. It is a thrilling rediscovery of one of the most familiar artists of our time.